Gametocytocidal drugs stop the malaria life cycle by preventing transmission from human to mosquito. This has the potential to contribute towards malaria elimination. There are several ways to fight malaria, which include vector control, malaria diagnostics and treatments. These measures reduce the number of people getting infected with malaria, identify those with malaria and cure them. But what if we could also protect the vector from malaria infection? Then that Anopheles mosquito that we didn’t manage to eliminate and that somehow was able to sneak into your home might at least bite you without being able to give you malaria. That’s because only a mosquito that itself is infected with malaria can pass the disease on. There is a number of drugs, gametocytocidal drugs, that protect mosquitoes from malaria by killing gametocytes – the sexual stage of the parasite which is responsible for onward transmission. How do gametocytocidal drugs work? Let’s start at the beginning, i.e. with the malaria life cycle in the absence of a gametocytocidal drug. 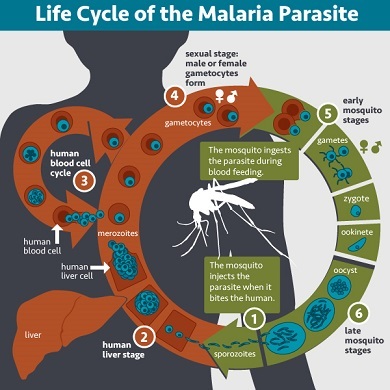 After being injected into the human bloodstream through a (1) mosquito bite and (2) some time spent in the liver, (3) malaria parasites in form of merozoites re-enter the bloodstream and then reproduce using human blood cells. (4) Some of the merozoites do not reproduce and instead develop into gametocytes. (5) Through another mosquito bite, gametocytes reach the midgut of a mosquito, from where they set out to conquer the mosquito’s salivary gland. (1) The mosquito bites another human, infecting her or him with malaria and thus completing the cycle. 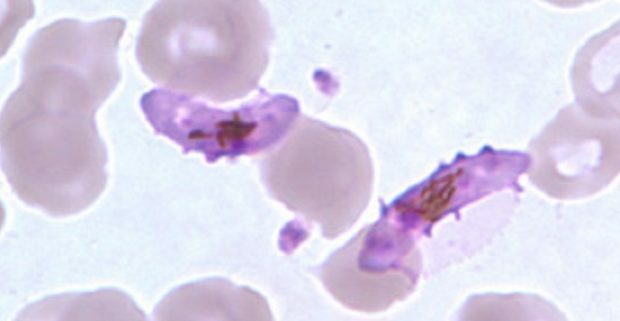 Without the administration of a gametocytocidal drug, gametocytes can be found in human blood even weeks after the start of malaria treatment. In a recently published study in Mali in which blood of malaria patients was fed to mosquitoes, one out of four patients who had received an artemisinin-based combination therapy (ACT) still infected mosquitoes with malaria seven days after treatment had started. A gametocytocidal drug stops the malaria life cycle by killing gametocytes either within the human bloodstream (4) or within the mosquito’s midgut (5). In consequence, the mosquito does not become infectious with malaria. In the above mentioned study in Mali, gametocytes were still found after all tested treatments. However, gametocytes found in the blood of patients who had received primaquine failed to infect mosquitoes. Another recent study (in Burkina Faso) also showed that the presence of gametocytes did not result in mosquito infection after treatment with primaquine. The reason behind this non-linearity between gametocyte density and infectivity rate could be that in both studies gametocytes were detected through microscopy, which cannot distinguish viable and infectious gametocytes from dead or noninfectious living gametocytes. Also, primaquine may alter the gender ratio of gametocytes in such a way that transmission still will be interrupted (a mosquito needs to ingest at least one mature male and one mature female gametocyte for it to become infectious to humans). The study in Mali found a near complete prevention of transmission in all patients, even those that had received the lowest dose, i.e. 0.125 mg/kg, of primaquine. Thus, a single low dose of 0.25 mg/kg primaquine, as recommended by the WHO, should suffice in preventing onward transmission of Plasmodium falciparum malaria infection. Another question is whether a single 0.25 mg/kg dose of primaquine is safe, especially for G6PD-deficient individuals, who might suffer from haemolysis (loss of red blood cells) as consequence of taking primaquine. The WHO considers this risk as low. A recent study on the North-Western Myanmar-Thailand border also supports this position, stating that a single low dose primaquine (0.25 mg/kg) does not cause clinically significant haemolysis in G6PD-deficient individuals, in addition to a recent study in Tanzania. However, this question does not have a straightforward answer as many factors play a role, such as age, gender, variant of G6PD-deficiency and health condition of the patient. It is furthermore complicated by the possibility of drug-drug interactions, such as in combination with antiretroviral drugs. There is the need to test currently used antimalarial drugs and those still being developed for their gametocytocidal activity. Six drugs which are already in use (hydroxychloroquine, artesunate and pyronaridine) or in the development pipeline (NPC1161B, OZ277 and methylene blue) were found to reduce gametocyte viability by at least 50% in vitro (in tests outside a living organism). However, not all of these drugs showed the same potential when administered to patients, while primaquine did not do so well in vitro but is likely to have a greater effect in vivo (inside a living organism). Moreover, only tests that show infectivity rates instead of simply gametocyte density will provide reliable data on the efficacy of a drug to stop onward transmission. Gametocytocidal drugs are used to reduce and ultimately eliminate malaria at population level. However, they were not found to benefit patients who take them. Instead, they may even put these patients at a health risk (e.g. the risk of haemolysis in G6PD-deficient individuals who take primaquine). Hence, the questions how much risk for an individual patient is justifiable and how efficient are the drugs in blocking malaria at a population level are highly important. One issue regarding the transmission blocking efficacy of gametocytocidal drugs on the population level is the existence of hypnozoites, a stage of P. vivax and P. ovale which can stay dormant for months or years before producing new rounds of transmissible parasites. Currently, chronic asymptomatic carriers tend not to receive antimalarial drugs. As they are usually the largest subgroup in a population, this might require some rethinking. Anja Choon works for the German Red Cross. Former employers include Nigeria Health Watch and the University of Münster. She holds a PhD in Field Linguistics from the School of Oriental and African Studies.